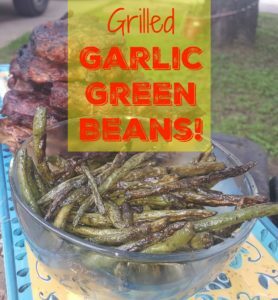 Grilled Garlic Green Beans Recipe! I hope everyone had a wonderful Mother’s Day! We had all the kids and grandkids over yesterday for a little cookout and I made 2 delicious recipe that I want to share with you. The Stuffed Jalapenos I made will go up next week but you can see a picture of them here. 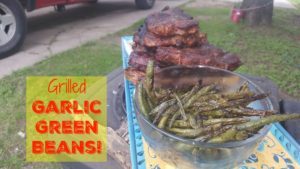 For now, I want to show you my favorite way to make fresh green beans. Keep in mind that if you don’t have a grill or a vegetable wok, that you can do this in a skillet just as well. 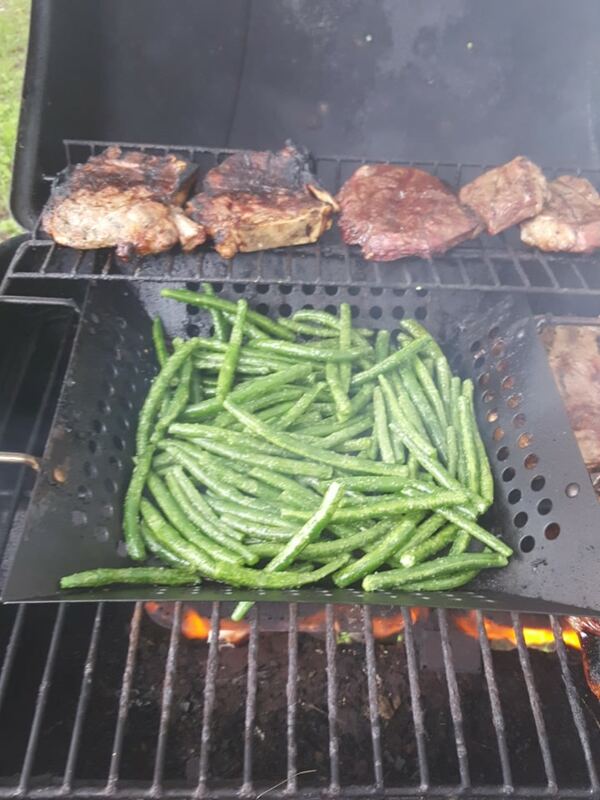 However, if you have a grill, you should absolutely buy a vegetable wok. They are usually less than $20 and make it easy to grill up veggies while you are cooking your meat. First, get your beans and cut off the tips, then put them in a Ziploc bag or the equivalent. 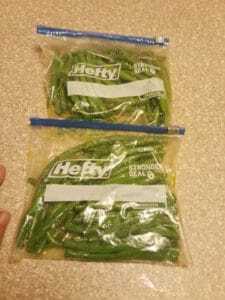 I divided my beans among 2 bags only because I didn’t have anything bigger than a quart size but you don’t have to do this if they will fit. Then add enough Olive Oil to coat the beans, in my case it was about a quarter cup per bag. 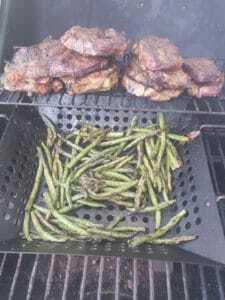 Then season with Garlic Salt (make sure it contains no added sugar, spice blends are sneaky) or garlic powder and salt. Then shake the bags to evenly coat all the beans and throw throw them in the fridge for a couple hours to marinate. Then throw the beans into your vegetable wok over an open flame and stir occasionally to cook evenly. 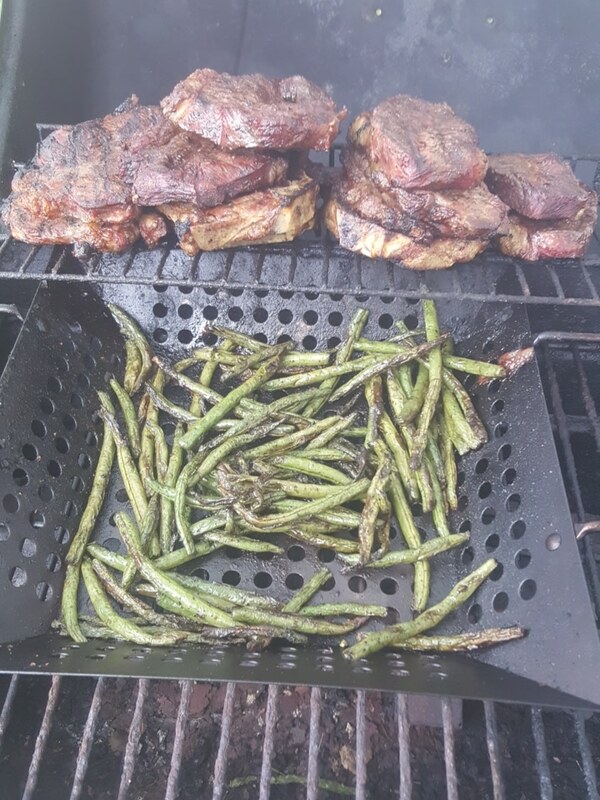 Again, you can cook them in a skillet but everything tastes better on the grill. The beans are done when they darken and soften. They also shrink a bit when you cook them so always make more than you think you need. Serve them warm and enjoy! A Paleo, Vegan, and Vegetarian grilled green beans recipe. PREVIOUS POST Previous post: What’s Sugar Free at The Grocery Store: Sausage Edition! Love it! Thanks for trying it out!